The Rotary Bottle Washing Machine is compact and highly efficient machine with elegant look. This multifunctional multi featured bottle washing machine meets the GMP requirements of washing for glass and plastic bottles. The rotary bottle washing machine operates on the rotary principle with “GENEVA” mechanism and requires manual loading and unloading of bottles. 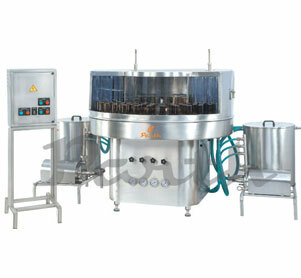 The bottles are loaded on the subsequent indexing part of rotating platform and are cleaned in series of operations. Specially designed bottle holders provided to hold bottles with neck diameter. The bottles are placed in an inverted position in these cup shaped holders. Spraying showers does the external cleaning of the bottles. Solenoid valves are provided to enable the regulation of wash timings, it also spraying water when bottle are stopped means insure saving of water, and sequence of various washing media to suit specific requirement. Change parts required (A) Neck Dia: Bottle holding pocket. (B) Flat Container: Special type of cup. * Depends on container size. Geneva Mechanism used to maintain timing between two wash.
Five Wash (Four inner and one outer). Stationary Spray nozzles, Collection tray & Recirculation System avoid Contamination of water cycle. To adjust sequence of washes as per customer’s SOP. Solenoid valve for each washing sequence reduce leakage & wastage of water. Higher pressure centrifugal pumps to clean bottle properly. Pumps and Tanks are fitted on separate stand for easy cleaning & maintenance. Height adjustable bottle guide for pet or light weight bottle.